9th CG collection of Aozora Ichi! Featuring 10 girl characters appear in Onimusha series from 1 to 3, and Buraiden. CG collection of Robot girls being remodeled (this item is for those who have that kind of fetish). KOS-MOS get bewildered of the gap in between the play and Sion's real intention. Hey everybody listen to me! That four chicks of Wedding Pe*ch were humiliated by the group of middle-aged mendicants in the name of having a God's child). A set of 2 digital doujinshis: Maichan Kanno Shashinshu and Toukon Musume Kanno Shashinshu. CG collection of G*akuten Saiban. Total of 20 CG pictures for adults only. Covering various kinds of characters from major to minor characters. Enjoy viewing Kanna's shameful figure, cannot disobey the sorrowful destiny. 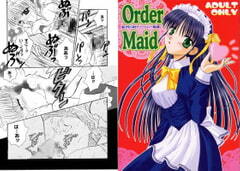 2 original maid mangas and a short! That pretty maids serve you!! Who do you like in the group of girls....?